... We talked about common concerns such as how orders are processed on the site as well as the process related to returns/replacements/refund. Both posts have even housed comments about customer issues and shopping at Lazada in general. While I am in no way connected to the site (I'm just a regular shopper like everyone else), I try as much as I can to find answers to some of the questions posted. But since I've been using the site since 2014 (see My Experience Shopping through Lazada.ph), I have tried a couple things on the site such as ordering items which are shipped abroad, sending an item to a different address other than mine and more. For payments, I always prefer cash-on-delivery just so I won't have to worry much in case the item never arrives. Paying via credit or debit card or any of the other newer options (i.e. PayPal, Alipay, Lazada E-Wallet) will be such a hassle if anything happens to the order, i.e. wrong size, incorrect or missing item and so on. 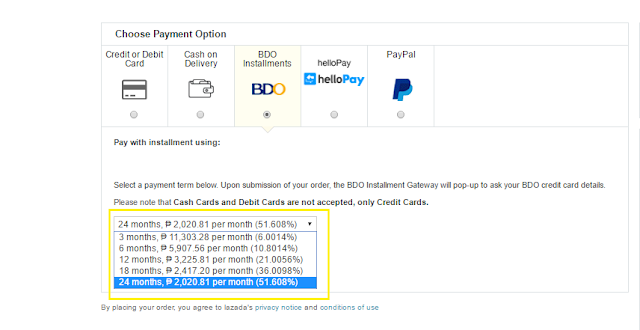 At one point, I have also tried BDO since it's the only option which offers installments. 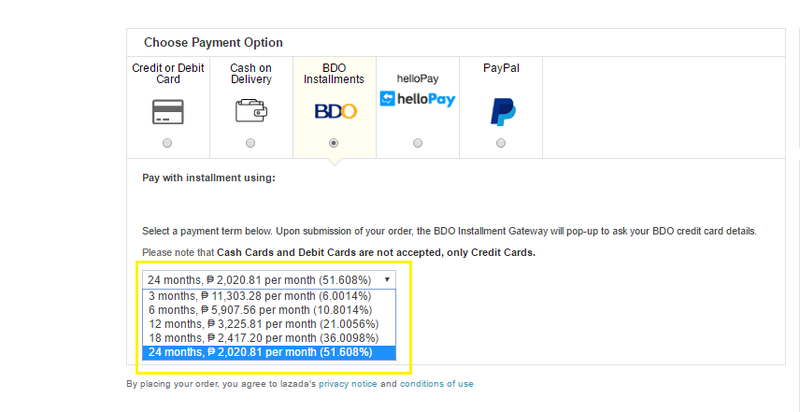 To use this option, just shop as you normally would and choose BDO Installments once you get to the payment section. Note that this method applies only to Banco de Oro Credit Cards, and not debit cards or cash card accounts. Be mindful of the interest rate as well. While you pay less per month as the monthly term extends, the interest rate also increases. Apart from taking note of the interest rate, other precautionary measures include choosing the shop carefully. While it's not easy to become a seller in Lazada as the site conducts background checking first and requires certain documents, there are still shops with poor reviews. So check the Lazada seller's information first before buying through BDO installments. You can view the seller's profile on Lazada, search for their pages outside the site, or even possibly find a brick and mortal shop location. we use BDO installment to pay a cellphone that we order this afternoon and have a successful transaction also get a screenshot of it. then after a few hours my order has been cancelled.so we notify our bank regarding the issue. Bank said it has been paid already because we have more than enough credit limit to pay what we ordered. so i try to get lazada Costumer support aka LAZBOT(Live Agent) and said the reason why its been cancelled is there is no payment recieve and also there are no refunds coz payment hasnt recieve. so i Send His/Her the screenshot of my succesful BDO installment copy that the payment has succeed. the she/He said that "i will go ahead and coordinate with our payment team so we can check what we can do to resolve this issue. and we will just send you an update via email. Right now im still waiting for the updates. OMG! mahirap magbayad ng monthly bill. na wala ka namang nakuhang item na inorder mo. Followup mo sa Lazada support. They do help naman, just be persistent sa pag-check ng updates.